The Wars of Pooch: 6 Day Para Challenge 2- Paint! Well, I took a very important first step yesterday into completing this challenge, I actually bought everything I am going to paint! So, along with that, I began with getting the whole first platoon based, and the second at least glued to their bases. I wasn't really sure how I was going to paint them, so when it came time to paint the first platoon there were some definite teething issues, with me having to go back and cover up issues etc. Not ideal, but probably was always going to happen! So, the question of course is, how much did I get done yesterday? As always, not as much as I had hoped! I managed to get half of the first platoon basically done, barring their bases, and a little touch up on their faces, which I only realised I needed to do this morning when I looked at them.... As well as that, the rest of the platoon, plus the Company HQ is about half way done, I should be able to knock them off before lunch! 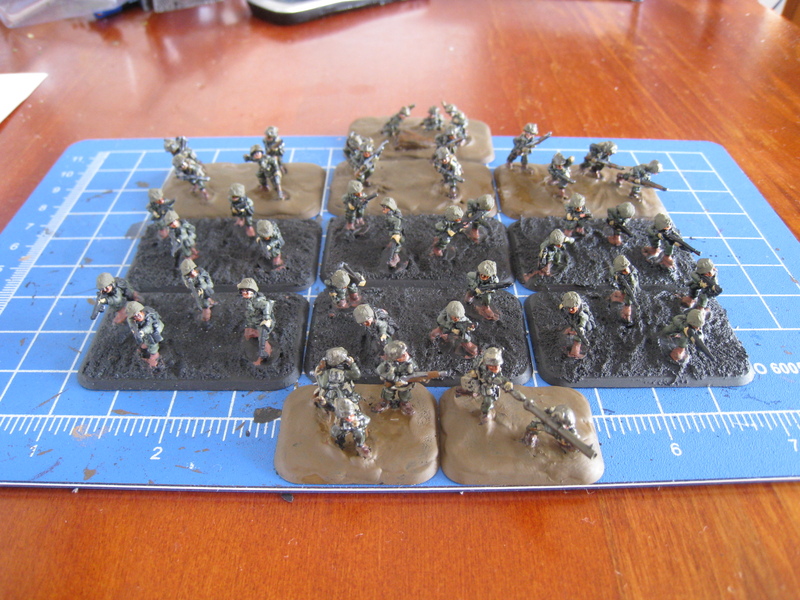 So, thats the first platoon at its current stage, half done! Today's goal? Get everything assembled, and hopefully get to work on the Mortars and the Jeeps- as well as finishing the first platoon! So you are actually ahead of me now Pooch! I am only painting 3 more stands than you, I thought it would be more! You might still count as ahead, you have everything based! Nice challenge you have there guys. But painting under pressure would be nothing for me!